Reunion Island Tourism (IRT), the island’s primary tourism marketing body, has announced the dates of the final round of “Alon Bat Kare,” the main domestic tourism promotion for the people of this French Indian Ocean Island. 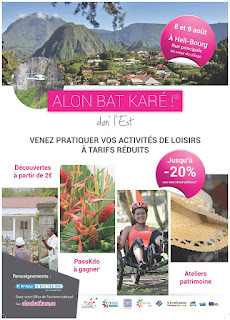 This now fifth edition of the promotion will this time be hosted by the picturesque town of Hellbourg in Salazie, a small town nestled into the mountains of the interior of the island which takes visitors literally back in time. The event is taking place this weekend on August 8 and 9, and as has been the case before, major discounts are available for locals who make their way up the winding mountain roads to partake in either tourism activities or simply to enjoy a good meal in one of the town’s restaurants. Entrance fees or activity fees range from just 2 euro to 50 euro, and accommodation booked for the coming weekends, as long as done this weekend through one of the IRT regional offices across the island, will also attract major discounts for locals. Activities lined up by IRT and their local office are guided tours of Hellbourg, a samosa-making workshop, mat weaving with coconut fibers, a workshop for floral arrangements, food tasting, mountain bike tours, and of course the famous helicopter rides, among many other activities.